Victoria is a great destination for a number of reasons. While eating every meal at a restaurant while traveling can get tiring, with so many options and different tastes, you’ll wish you had more meals in a day to take full advantage of Victoria’s top restaurants. Whether you consider yourself a foodie, eat purely for fuel, feel like testing out foreign cuisine, or just enjoy great food, there’s the perfect place for a bite in Victoria, B.C. Victoria BC is a top destination for those interested in all things food. Thanks to Vancouver Island’s rich lands, many of Victoria’s restaurants use home-sourced supplies in order to create some of the best eats you can find. Canada’s diversity also lends a hand to Victoria’s food-haven aspects, as there is a restaurant for every desire and palate. From a quick bowl of ramen, to a full, fine-dining, farm-to-table experience, the city has it all. It is also dubbed the Brunch Capital of Canada, so if you’re looking for the perfect way to spend a Sunday morning, go no further than Victoria’s brunch hotspots. Worried that you’ll hit all the highlights early during your trip? Victoria has the second highest number of restaurants per capita in all of North America. You could eat every meal out for your entire stay, never have to go to the same place twice, and still have an entire notebook of restaurants to try next time you come to town. By the time you made your return debut, there will likely be a number of new top spots you’ll have to try. Besides restaurants, Victoria also offers a great number of food tours, food trucks, quick snack spots and incredible markets. In fact, there are so many farmers markets within the city during the summer, that you’ll likely be within close proximity of at least one no matter where you’re staying. The markets are a fantastic way to explore local life, and dive into some fantastic fresh foods and artisan products. Last but not least, as the Beer Capital of British Columbia, Victoria offers the perfect accompaniment to any fantastic meal. Trattoria – “an Italian style eating establishment serving classic home-cooked Italian cuisine in a warm and welcoming neighborhood atmosphere”. 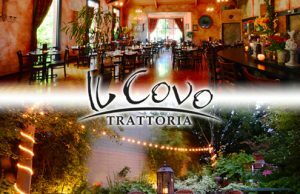 Located in a 100 year old heritage building in historical James Bay and steps from the Inner Harbour, Il Covo Trattoria is a memorable and unique Italian dining experience. Being a trattoria, it’s the perfect spot for special occasions, intimate dinner dates or parties. Enjoy truly authentic, rustic Italian food in a warm old world Tuscan ambience. During the summer season dine al fresco in the popular Italian inspired garden patio. Come and enjoy a taste of Italy! Buon Appetito! San Remo was founded in 1985, when Dino and his family opened a new restaurant promising an authentic Greek vibe and delicious meals. Ever since, our restaurant has offered great service, food and has provided a welcoming atmosphere to all guests for over thirty years. Stop by for lunch or dinner and enjoy Greek classics, Italian favourites, handcrafted pizzas, soups, salads, traditional appetizers and a great selection of wine and beer. You can even take it to go. We also feature a number of dine-in and weekly specials. Come for the food and stay for the atmosphere at San Remo!